Yesterday I zipped down to New York City to see Hannah as Katherine/Kate in The Taming of the Shrew at NYU’s Tisch School of the Arts. As always when I see her perform, I’m awed by her talent. As her mother, I can’t help but be biased in my assessment, but she’s really good! I took along my Hitchhiker to knit on the train. Almost done with the first ball (of 2) of Liberty Lite. After the success and enthusiasm of last fall’s class — from Seema, our intrepid novice, to Judy’s first sock — I’m happy to offer two new classes: one for beginner’s and one for intermediate knitters. I sent the following email to about 25 local friends this morning and looking forward to the responses. Would you like to learn to knit? Do you know the basics but are ready to move beyond a scarf? You’ve got knit & purl stitches but don’t know how to bind off or fix your mistakes? In this class, you’ll make a lovely hat and develop a strong foundation of skills so you can continue knitting different types of projects with confidence. You will learn how to: cast on, knit, purl, decrease, increase, knit back and forth, knit in the round, knit on double-pointed needles, bind off, and read a basic pattern. Materials needed: Approximately 175 yds heavy worsted wool (approx 4-5 stitches per inch on size 8-10 needles), size 9 16″ circular needles, size 9 double-pointed needles, stitch markers, darning needle. This class is for knitters with some experience who are ready to learn something new and become more confident. If you are working on a project of your own and/or are ready to challenge yourself with cables, lace knitting, chart reading, socks, or other knitting skills, this is the class for you. We’ll work in an open workshop setting where instructor and fellow knitters support each other to create and finish knitting projects. Leave a comment with your contact information, knitting experience (if any), and — for the intermediate class — what you’d like to learn. Payment information, address, and a list of materials needed for the first class will be sent promptly. I’ve been knitting off and on for several decades and absolutely love it — the portability, the creative outlet, the solitary and social aspects of knitting, the pleasure of finishing something, and the joy of giving or wearing. I’ve taught knitting off and on for the past 8 years in a variety of settings. My first post — back in May 2010 (!) — highlights some of the reasons why I love this craft. Christmas came and went and was lovely, if a bit strange this year. All agreed that we had an awesome tree. I think every Christmas tree is beautiful just by being, but this balsam was particularly lovely and well-proportioned even before it was decorated with our extensive ornament collection. The decorating festivities included Grandma, lots of laughs, and only two broken ornaments. We’ve entered a new part of our life journey over the past month or so since my father-in-law, who lives nearby and has been in a rehab facility for six weeks, decided after nearly six years of kidney dialysis and a failing body (multiple spinal fractures, constant pain, limited vision) that he doesn’t want to die in an ambulance or in the emergency room. He’ll have his last dialysis treatment in 10 days and will then go home where he can die in peace — without pain, surrounded by the familiar and the loved — including his wife of 52 years and his remarkable daughter and son (my sweet husband). To be sure, it’s sad, but it’s not tragic, and in some ways, it’s a sacred time. His decision and planning, aided in large part by son Patrick and daughter Claire, have given his family and friends a gift in the opportunity to express their love and appreciation to him. It’s a gift to himself — although it may not feel that way all the time — to be able to hear those expressions, to accept them with a humble and generous spirit. On the knitting front, Kevin was pleased with his new socks even though one is a bit too big. I took my circular scarf down to the wire — knitting during cocktails on Christmas Eve and weaving in the ends on Christmas Day. Thanks to Claire for capturing me in all my knitterly glory! My mom’s knitting group friend, Barbara, was right when she told me that Triana Lux would knit up quickly. Only 5 “stitches” wide, it’s a very short trip back and forth on the needles. As I noted previously, the yarn is more like a fishing net than traditional yarn. Since the loops are a set size, your tension and needle size don’t make a whit of difference. I’m not much of a sparkly, frilly person (and this photo doesn’t show the sparkle well), but I’m a big fan of finishing. And this was fun. When it comes to yarn, I’m pretty conservative, so I was surprised at my recent purchase of a skein of the kinda crazy Triana Lux by Katia. Described as a “novelty, mesh yarn,” it’s reminiscent of a fishing net. You work only with the top series of loops, leaving the rest of the “net” hanging. Since the size of the loop is set, your tension doesn’t matter nor does your needle size. I used wooden size 9 needles since the yarn was pretty slippery, but it doesn’t really matter what you use. The whole thing was rather slippery and looked like a tangled mess of slightly sparkly cream and grays. Since I don’t yet have a photo of the finished product, I’ll introduce you to Barbara, the lovely knitter who convinced me to buy this funky yarn. She’s part of my Mom’s weekly knitting group. More on them later, too. One of my favorite sayings, courtesy of a college friend who often finished her papers in the wee hours of the morning, is “Pressure makes diamonds.” Some of us work well under pressure; others don’t. I’m somewhere in between — deadlines are motivating, but I don’t always end up with my best product. I don’t often knit on deadline. Usually I work on projects at my own pace with no real “due date.” Even baby hats and blankets are still welcome gifts when the wee one is a few months weeks old. My most recent project was an exception. My lovely niece requested a scarf for her 13th birthday — a very specific scarf: a Ravenclaw House scarf from the Prisoner of Azkaban movie. After some online research, I learned that the scarf colors were to be navy and bronze. Bronze? It’s a metal — not really a color. Where was I going to find bronze yarn? Enter the helpful ladies at The Island Yarn Company. In a mere 15 minutes, they’d come up with the perfect solution. Two “yarns” from Feza: “Teza Taniazi Iplik,” a golden ribbon, and Mezmerize, a copper novelty yarn. Together, they combined to make the perfect bronze. 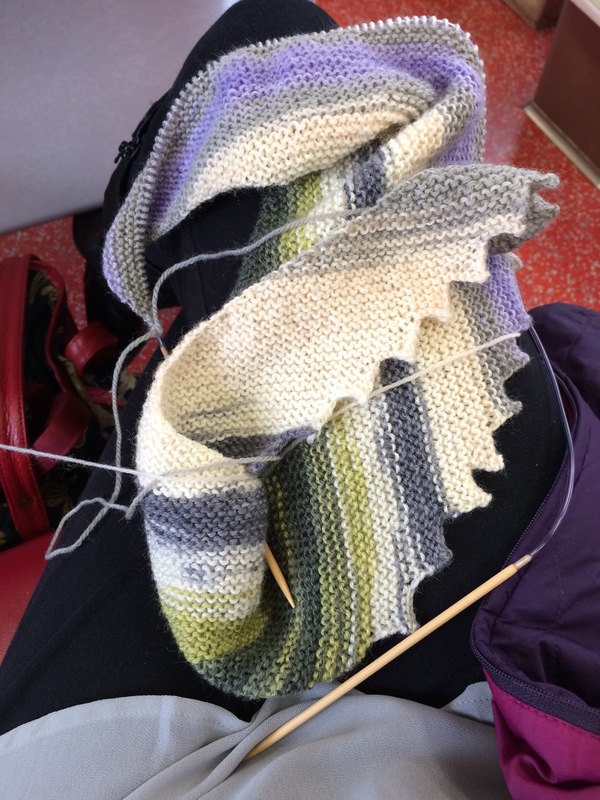 Knowing that someone was waiting for the finished product, I knit as often as possible — even in a slow-moving taxi while on my way to a client meeting (after knitting on the plane, of course). I’d planned to include a short fringe but encountered two challenges. The first, fraying ribbon, wasn’t insurmountable once I discovered that the end of the ribbon melted when heated with a match. The second challenge turned out not to be a challenge at all. The recipient didn’t want a fringe. Whew! Hoping to get a photo of dear, newly-minted teenager Phoebe sporting her scarf soon. When asked what they’d like to make for their first knitting project, many of my students suggest a scarf. I encourage them to try something else. most importantly, you should finish with a sense of accomplishment and excitement about your next project. A cotton facecloth with changes of color, garter and stockinette stitches, slipped stitches across rows. A golf club “cozy” with a pom-pom — knit by a student in my beginning knitting class. Baby hats — in any color, multiple designs, colors, yarns. If you don’t know a baby, make a hat and send it to your local hospital. They have babies whose wee heads need to be covered in love. A hat for yourself or a friend. As you can see, Ashley was thrilled with her first project — she’s radiant! In my nearly five decades of life, I’ve learned a few things about myself. Fear not, I won’t share them all. Although I consider myself an “in the moment” sort of person, grateful for the many blessings in my life (and there are many) and rarely wishing for something else, I often find myself looking forward to the Next Wonderful Thing. As I continue to make slow-and-steady progress on the lovely Cleite shawl (nearly 3 rows at Kevin’s baseball game yesterday), it is slow going indeed. It shouldn’t surprise me, then, that I’ve found myself dreaming of the simplicity and creative ingenuity of the Noro Stripe scarf by the talented Brooklyn Tweed (who, in addition to being a great knitter, takes stunningly beautiful photographs of knitted creations). Last year I knit two, and still have one that I’ll give as a gift to someone whose neck is chilly. Noro Silk Garden is lovely to work with, feels great in your hands, and comes in many different color variations. I picked two that blended some of my favorite colors (even though I’m not the wearer of the scarf). it’s knit with two different balls of yarn, in two different colorways, so the stripes interact. You knit two rows with one ball, then two with the other ball, then back to the first, etc. The “extra” yarn in between rows is kind of invisibly absorbed along the edge. Nothing to weave in or join.